There are plenty of easy-distance destinations for a luxury weekend escape from Paris. 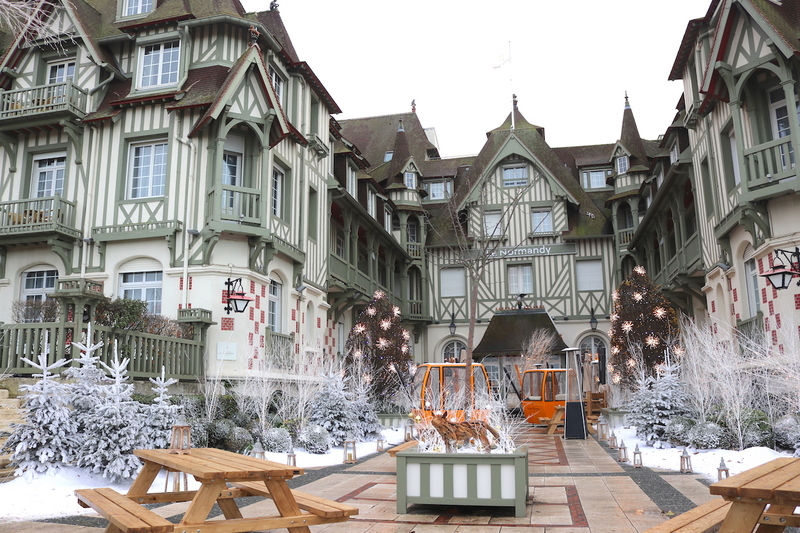 One of the less known by foreigners, especially during winter, is Deauville. This typical city of Normandy, famous for its yearly American film festival, offers fantastic Nothern France sceneries and a romantic town center. As well as a stunning jewel: Le Normandy Barrière, a beautiful five-star hotel with gorgeous sea views from Barrière collection. With less than 4.000 inhabitants, Deauville is a pretty small city in Nothern France. But guess what, there you can find somes Louis Vuitton, Hermès, Dior and plenty of luxury multi-brand stores… How is this possible? Because Deauville hosts every year the American film festival with its collection of superstars, because the city appeared in many international movies, and because it is known to be the second home for many rich parisians. That’s explains for sure the success of Le Normandy Barrière, the one and only five-star hotel of the city located just 10-min walking from the train station. Le Normandy Barrière welcomes guests in a historical Norman building, right in front of the beach, linked to the nearby Barrière casino through basement. This is an old lady of Deauville – in very good shape – proposing a mixed Art-Déco / Norman / contemporary interior design by Nathalie Ryan. It makes the atmosphere pretty pleasant, a bit like at home and definitely luxurious. The entrance facade is really a trigger for a Wow factor! The lobby is really the place to be on Saturday evening, all the Gotha is meeting there. A pianist is playing all night long while barman is serving his magic and people are coming in and out from La Belle Epoque, the hotel’s fine-dining restaurant. At the time of my visit, there were also a venture with Veuve-Clicquot that designed part of the exterior gardens. Amazing! The hotel has also a Spa with steam room, sauna, indoor pool and offers many kind of body massages & treatments. And that’s just perfect to enjoy a relaxful weekend, together with the attached casino – an institution in the city by the way. I had a lovely Deluxe Sea View Room – #313 – on last floor, a kind of romantic attic room. 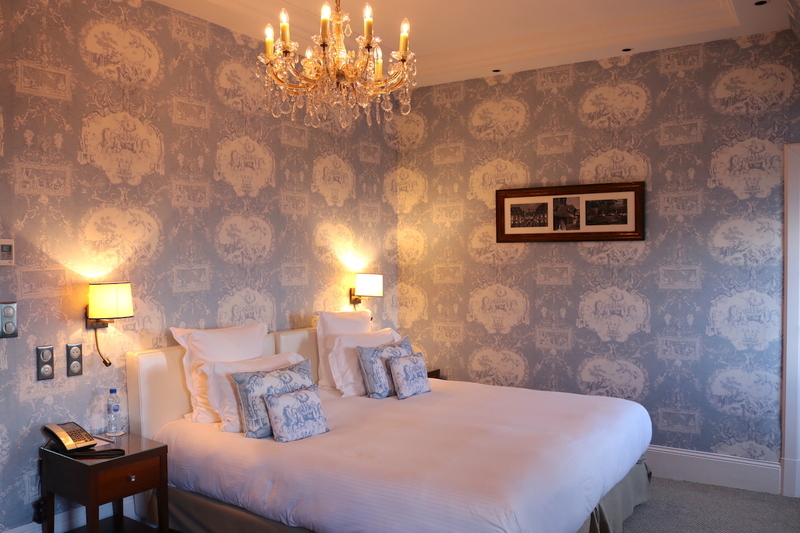 I really liked it, especially its Toile de Jouy wallpaper and views over the Channel. The bathroom was surprisingly basic and completely disconnected from the rest of the interior design. Pity. At the end, despite of its tiny size (around 30sqm), I enjoyed the time there and had 2 wonderful nights. Quality of mattress, linen and furnitures are good, not to mention the TV system. I strongly recommend to book a room with sea view, that’s really a huge bonus and that turns a pleasant stay into a magical stay. 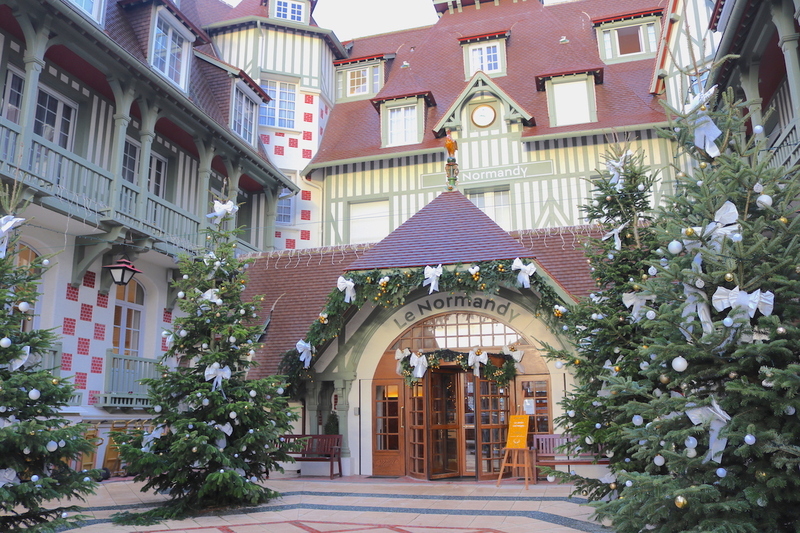 I only experienced breakfast at Le Normandy Barrière, inside La Belle Epoque restaurant. Buffet was huge, with plenty of choices for all tastes: American breakfast, continental, fruits, pastries, cheeses, etc. and a Chef was available to cook eggs & crepes on request. Gorgeous! If I had a negative point to highlight, that would be service quality: during my stay, I dealt with some junior and some senior staffs. While first ones were pretty up to five-star standards, visibly coming from nice hospitality schools, the second ones were a bit dated in their way of serving and “used” in a way. With them alone, I would have feel more in a three or four-star hotel. But that doesn’t mean my stay was bad, it just means that the overall level of service could be easily improved to make this hotel perfect. 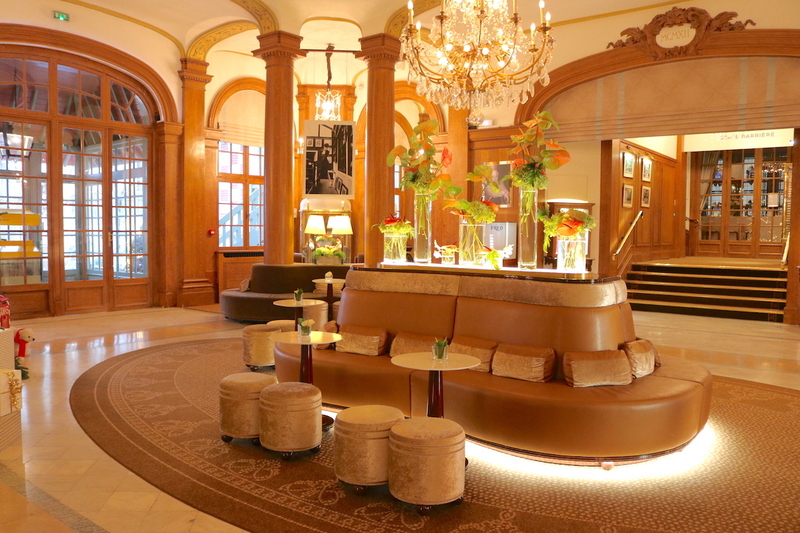 I truly recommend Le Normandy Barriere for anyone looking for a romantic weekend in Deauville. At walking distance from that luxury hotel, you will be able to reach a beautiful beach, some high-end shops and a casino. All of this, right in the center of that charming city and its historical houses! Stayed from December 07th to 09th, 2018 – Unsponsored media stay. Le Normandy Hotel Barrière opened in 1912, has been renovated the last time in 2016 and is now composed of 271 rooms & suites. I stayed in a Deluxe Room – around 30sqm – which public rate starts at EUR 209/night.